Today leave Montreux and journey to neighbouring Vevey, home to Charlie Chaplin once he’d fled the United States. Enter the world of Charlie Chaplin as you meet one of the 20th century’s most celebrated artists during a visit to the Chaplin’s World Museum. From there, it’s on to Basel where a warm welcome awaits you from the crew of your luxury Scenic Space-Ship. Your luxury cruise is about to begin and you’ll have the chance to raise your glass to the occasion at the evening’s welcome reception. Freechoice: Be immersed in a truly magical experience as you step inside the setting of the Hansel and Gretel fairytale during your visit to the Vogtsbauernhof Open Air Museum in the heart of the Black Forest. Alternatively, if you’re feeling more active, discover the magical Black Forest during a hike and cable car ride, or take a guided bike ride. Freechoice: Visit Strasbourg, the capital city of the Alsace region in northeastern France, where you’ll discover La Petite France, the unique historic quarter, and stroll through the Old Town with its half-timbered houses and distinctive Alsatian winstubs. Alternatively, journey to Mittelbergheim in the Alsace and sample some of the best wines the region has to offer. Freechoice: Experience the thrill of the Hockenheim Formula 1 race track with a museum visit and an insider tour of the circuit, or join an expert local guide on a historic tour of Heidelberg, where you’ll visit Heidelberg’s Renaissance castle. The castle ruins are among the most important Renaissance structures north of the Alps. Alternatively, for a gentler pace, join a local guide for an orientation tour of Heidelberg, followed by some leisure time. Freechoice: Journey to the Grand Duchy of Luxembourg for a guided tour, and enjoy some free time to discover the many delights of one of Europe’s smallest countries. Alternatively, take a guided walk through Trier, or take in beautiful Bernkastel. Freechoice: On arrival in Koblenz take advantage of a guided tour of this historic city, lapped by the waters of two of Europe’s most beautiful rivers. Or visit a local winery for a guided tour and tasting of its fine wines. You also have the option of a guided cycling tour of this fascinating city. Freechoice: Discover the charming town of Xanten on a guided tour, including a visit to the town’s famed archaeological park, showcasing the remains of Roman settlement in the region. Alternatively, try something a little different with a visit to the Zollverein industrial site, once the largest and most productive coal mine in Europe, today a World Heritage-listed Site. Freechoice: Explore the Arnhem Airborne Museum and learn about the Battle of Arnhem. The Airborne Experience allows you to follow in the footsteps of the British parachutists who made their way across dangerous terrain to Arnhem in September 1944. Alternatively, visit the Netherlands Open Air Museum and discover historic houses, farms and windmills. The museum portrays the impression of daily life for the average Dutchman over the past few centuries. Or, if you’re feeling more energetic, take a guided bicycle tour to the neighbouring town of Nijmegen. Freechoice: Choose a guided tour through the quaint streets of Veere, or cycle the town with a local guide and admire the surrounding dykes. Alternatively, marvel at the modern wonder that is Holland’s Delta Works, including a visit through the Storm Surge Barrier. Freechoice: Be seduced by beautiful World Heritage-listed Bruges, or discover delightful Antwerp on a guided walking tour, followed by leisure time. 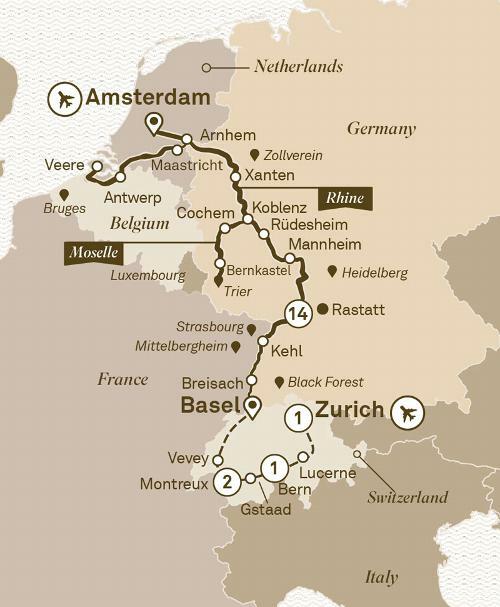 Embark on a 19 day journey through the alluring Rhine & Moselle rivers on board a luxurious Scenic Space-Ship. Discover the iconic sights & charming cities. Anyone who doesn’t believe in the power of romance has never travelled down this stretch of the Rhine, or its idyllic tributary, the Moselle. You’ll get the opportunity to discover this beautiful land for yourself, visiting Zurich and Lucerne with Lake Geneva and the Swiss Alps serving as majestic backdrops. And that’s just the beginning. From Lorelei, the Rhine river siren said to lure sailors to their demise, to the legendary Black Forest, which still resonates with imaginative children’s tales, there are stories and romances galore to discover, and delight in. You may even compose a few new ones of your own.